Joseph D’Lacey’s Black Feathers is an interesting anomaly in the world of apocalyptic fiction. 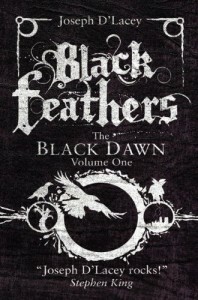 Instead of focusing on a dystopian post-apocalypse, as is the fashion nowadays, Black Feathers consists of two interlocking plot threads: one that starts in modern-day and continues through the fall of society, and one that follows a character hundreds of years in the future. It’s also the first part of a two-book series which continues in The Book of The Crowman (December 2013). In the modern-day, Black Feathers focuses on the Black family, specifically their young son Gordon Black, who may be connected to a mysterious messiah figure named The Crowman. Crows seem to follow Gordon everywhere he goes. His mother and father are oftentimes accosted on the street by people with prophetic visions of a future where The Crowman heralds the beginning of the Black Dawn and Gordon’s part in it. The Crowman is an interesting combination of savior and destroyer, sometimes described as a demonic presence, a half-man half-crow who only wants to destroy the world and at other times as a healing presence with a deep connection to nature. The more we hear about The Crowman, the more unsettling and dangerous he seems, even as it also becomes increasingly clear that Gordon is deeply connected to The Crowman. In the far future, Black Feathers tells the story of Megan Maurice, a young woman picked to apprentice with her village’s Keeper, a sort of combination medicine man and archivist tasked with keeping the story of The Crowman alive. Megan must travel along the Black Feathered Path to cement her destiny as the next keeper, a journey that involves visions of the past as well as harrowing encounters with The Crowman’s more animalistic aspect. Megan experiences visions of Gordon’s life and tasked with recording them in a special journal for safekeeping. One thing I really liked is that Megan’s world might be “post-apocalyptic”, but it doesn’t feel ruined. She has a comfortable life in a small village, and it is only when she ventures outside that safe place that she begins to encounter danger, all in the name of traveling on her path towards becoming a Keeper. In fact, there are a lot of things I liked about Black Feathers; the portrayal of The Crowman was particularly nuanced and unsettling, and I also liked the juxtaposition between the modern-day and far future. I love the idea of a messiah who isn’t so black and white, simply because maybe the world needs a little destruction before it gets saved. The book’s true villains, the power-hungry Ward, were a bit more stereotypically drawn – the bloodthirsty corporate influence made flesh – but that didn’t make their methods any less terrifying. My biggest complaint is with the book’s pacing. It took me a long time to make it past the first third of the book, and it was only when I decided to make a concerted effort to finish it that I finally started making progress. However, as I neared the end it became clear that Black Feathers wasn’t actually going to resolve anything major. Gordon and Megan both have some intense experiences as the book progresses, but these events seem relatively minor in the grand scheme of things. Black Feathers, sold as the first volume in a two-book series, feels more like the first half of one massive novel. I liked it enough to finish this first volume, but I’m honestly not sure if I’ll make the effort to pick up the second book later this year.